From examination to consultation, from nursing stations to administrative areas, the Ruckus Mobile Work Surface improves care provider and patient interaction. Adapting to a variety of uses, the Ruckus Mobile Work Service is all about user choice, flexibility and engagement. The simple-function handle allows surface height adjustment from 29 inches to 43 inches, to ensure that the care provider, patient and family members are at the same viewing level for more effective communication. 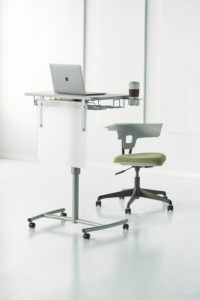 While in the standing height position, the Ruckus Mobile Work Surface supports a healthier posture, improving the users’ blood flow, energy level, mood and mental alertness. Movement is essential within modern healing environments that require more flexibility than traditional care models. With this highly mobile surface, care providers are able to easily maneuver Ruckus when and where it is needed, allowing for more face-to-face communication and improved engagement with colleagues, patients and family members. The Ruckus Mobile Work Surface can be tailored to meet a healthcare environment’s specific needs with functional options that include colorful translucent modesty panels, functional storage shelves, bag hooks and even recessing cup holders. Designed with caregiver and patient safety in mind, the Ruckus Mobile Work Surface exceeds ANSI/BIFMA testing standards and is backed by a comprehensive 15-year warranty. Sit/Stand – Height pneumatically adjusts easily; providing sitting or standing height desks for either focused work or interacting by a patient’s chair or bedside. Mobility – Casters provide mobility for caregivers to move from room to room. Options – The lectern can be specified with a modesty panel, cupholder, basket, or bag hook.